The M3 range of plastisol's is Rutland's most popular color mixing system to date. All the primary ink colors are PANTONE® licensed. This high performance, low-tack plastisol color mixing system is designed for printing on 100% cotton fabrics or alternatively, makes an excellent system for printing on poly/cotton blends when using a low-bleed underlay white. The Rutland finished Ink Color Mixing System allows printers to see a reduction in ink costs and an increase in production, creating a win win situation. 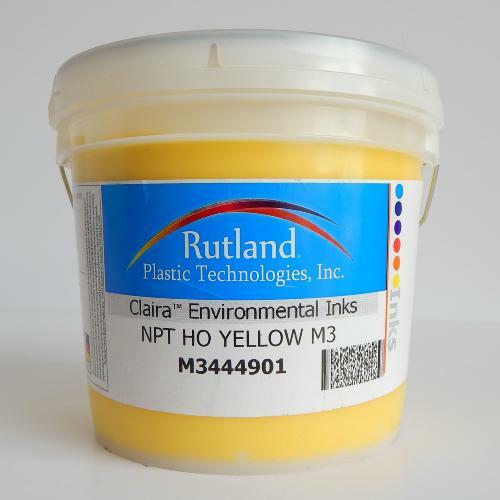 The Rutland M3 Ink Mixing System is a non-phthalate finished ink mixing system. M3 colors are opaque resulting in excellent coverage on dark garments. The tack free formula allows printing through a range of mesh counts without the need for a viscosity modifier.Use a white underlay when printing on dark fabrics for that extra "pop” in brightness. No build-up formulations ensure the highest print efficiency without down time for wiping screens. Mix thousands of finished ink colors by choosing Pantone colors from our M2007 Ink Mixing Software or by custom mixing your own colors! Pyramid Screen Products endorse best industry practice that operators should wear appropriate personal protective equipment (PPE) when handling all chemical products, even those classified as 'non-hazardous'. PPE for Pyramid Products includes gloves and safety glasses/goggles. Please request full Safety Data Sheet for full protection information.